Here are ten intriguing examples, including ones from both famously inventive companies and lone geniuses. We’re not saying that any of them are a catchy ad campaign away from becoming history-making breakthroughs–though one or two might stand a chance. We just like them. And if they ever amount to anything, we’ll be first in line to try out the resulting products. Think of this gizmo as a sort of Segway that goes up (up, up!) and down as well as backward and forward. If the blissed-out expression on the face of the guy using it is any indication, this flying machine not only isn’t terrifying, but has a positively calming effect–just the thing to take the airways by storm while we await the inexplicably tardy development of flying cars. But even so, we wouldn’t want to be operating a personal flight vehicle that conked out in midair–and a sky full of them is a nightmare guaranteed to make air traffic controllers wake up screaming. We’re pretty sure that this exceedingly cool Apple patent hasn’t popped up in a Mac, iPod, or iPhone yet: It’s for a three-dimensional projection system that doesn’t make you don special eyewear. How does it work? A powerful computer projects two images–one for your left eye, and one for your right eye–onto a screen that’s actually a “programmable mirror.” All the while, a 3D imager keeps track of your head position, helping the computer and mirrored screen optimize the projected image for clarity and realism. Here’s hoping that the technology comes to market someday–and that Apple unveils it with a launch event featuring an insanely lifelike holographic Steve Jobs. For centuries, audiences have shown their contempt for lackluster entertainment by booing, hissing, or (in Europe) whistling. 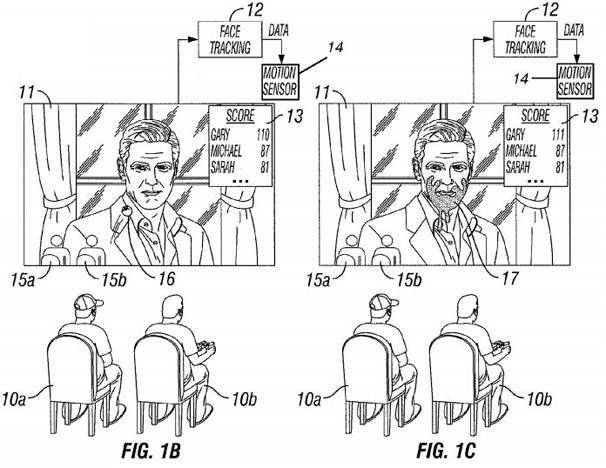 This Sony patent–eerily reminiscent of cult TV show Mystery Science Theater 3000–harnesses a technology that lets unhappy campers go a lot further. Using a game controller, they can send avatars right into a movie or TV show to fling rotten tomatoes at the actors–or even give them a swift kick. Admittedly, videos must be specially prepared by their producers to make all this possible. But it’s not as though studios and networks are funneling so much money into scripts these days that there’s nothing left for CGI. And if you ask us, Rob Schneider should never be allowed to make another film without this technology in place. Back in 1959 and 1960, competing technologies called AromaRama and Smell-O-Vision invited moviegoers to use their sense of smell to experience everything from pipe tobacco to exploding firecrackers. Then the idea went away (save for John Waters’ brief fling with “Odorama” in his 1981 film Polyester). But with 3D back in theaters and booming, why not give odor-based entertainment another chance? IBM’s “Computer Controlled Olfactory Mixer and Dispenser” uses cassettes filled with fragrances, mixing their contents together like ink from inkjet cartridges to produce an array of scents to accompany multimedia presentations. It’s a far cry from scratch-and-sniff cards. The patent shows cassettes with (relatively) uncontroversial fragrances such as banana, almond, and vanilla. But if you ask us, the gent depicted in this drawing just caught a whiff of something slightly gamy. Various digital cameras now incorporate smile-detection technology. Controller-free gesture detection is coming soon to a game console near you. 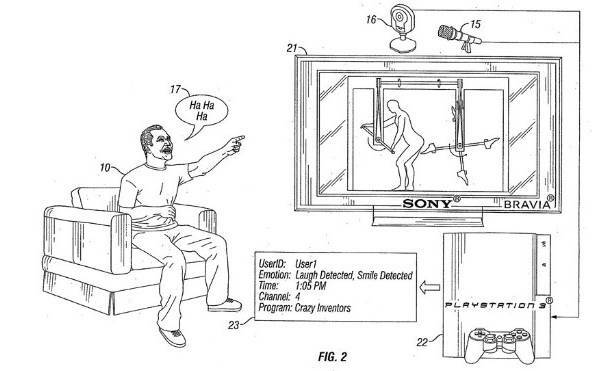 Sony’s emotion-detecting patent combines aspects of both ideas, using a Webcam and a microphone to help your PlayStation 3 determine whether you’re busting a gut with laughter, seething with anger, or half-dozing with ennui. Presumably, PS3 titles of the future will then adjust the game play in response to your mood. Here’s an idea: Maybe TiVo could license the technology and use it to gauge your taste in movies, and then record ones that match your preferences? Chuckling up a storm at a comedy would be a good sign; doing the same in response to a drama, not so much. Normally, we wouldn’t expect to get all that excited over an IBM patent for a technology designed to help data centers conserve energy and space. We’re kind of smitten with this one, though. It involves computers, storage, and other electronics built into brick-shaped modules that snap together. When a company needed more computing power, all it would have to do is stack up more bricks. The patent explains that the bricks can be assembled into cubes, walls, towers, and L-shaped formations, practically inviting IT people to get creative. Wonder if you could build something like this? Take Roomba, add a dash of the Addams Family’s Thing, and you end up with something at least vaguely akin to this robot patented by Panasonic. Afraid that a robot helper would be a clumsy recipe for disaster? The patent explains that the arm is smart enough to treat each object appropriately: It whisks away empty glasses at high speed; but presented with a glass containing liquid, it handles the receptacle slowly and gingerly. Maybe…but we can’t help recalling the trouble Dr. Strangelove had with a mechanical arm that didn’t have wheels. You’re wearing electronic goggles. You’ve donned a suit covered in sensors. But your virtual reality world still doesn’t feel all that real, because you can’t roam freely. This solution comes from a Russian inventor: Explore the world inside a giant, Wiffle Ball-like globe mounted on rollers, so you can walk, run, or even zip along behind the steering wheel of a fake car. The patent drawings seem to depict a truly mammoth sphere; even if you could afford it, you probably couldn’t squeeze it through your front door. But if there were any way to build a junior version–say as a Wii Fit accessory–we’d be all over it. You say the Scott eVest, with its profusion of gadget pockets, isn’t nerdy enough for you? Then you may covet the jacket shown in this Nokia patent for smart clothing, modeled in this drawing by an appropriately geeky-looking (and evidently quite self-satisfied) user. Like the eVest, it has plenty of pockets for your gizmos. But it’s also networked, thanks to a zipper that doubles as a fiber-optic backbone for routing data between pocketed items. Nokia envisions owners activating different products by pulling the zipper down to varying positions–which leaves us feeling grateful that the patent involves a jacket rather than pants. Logitech’s Harmony universal remote controls are impressive, but plenty of potential remains for building a radically better remote. And if any company is up to the job, it’s Apple, which has at least toyed with the idea of making a universal remote. This Apple patent, filed in 2002, predates the iPhone by years but outlines a decidedly iPhone-esque remote, complete with a touchscreen. The niftiest feature: It would be compatible with smart consumer-electronics products that could alert the remote to their feature sets, allowing one-click configuration. At this point, such an innovation needn’t take the form of a stand-alone device–it could be a major new feature of the next iPhone and/or iPod Touch. So that’s ten products we’d love to try if they ever make it past the drawing board. Seen any cool patents that you’d add to our list? Drop us a line below. Harry McCracken, the former editor in chief of PC World, now blogs at Technologizer.